Thermal Image Scanning - Michael Leavitt & Co Inspections, Inc. Thermal imaging uses infrared technology to detect very small differences in temperature. 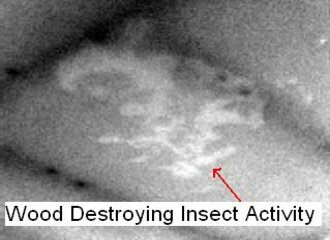 Every material has a unique thermal signature and when moisture, heat, cold, or wood destroying insects are introduced into the structure the thermal signature changes. The changes can be subtle or dramatic but with this incredible thermal image scanning technology the thermal signatures are detectable where they wouldn't be able to be seen with the naked eye. MOISTURE METER - The infrared thermal imaging camera is NOT a moisture meter. It simply identifies thermal anomalies. This device greatly aids in identifying areas that need further investigation. X-RAY VISION - The infrared thermal imaging camera is NOT an X-ray vision scope. It does not provide the user with an immediate Superman S on their chest with the ability to clearly see inside walls. Instead, it identifies thermal differences. SILVER BULLET - The infrared thermal imaging camera is NOT a silver bullet solution, but when it is used in conjunction with other technologies thermal imaging has helped us to identify issues that are rarely identified during the limited visual home inspection process. PLEASE NOTE: It is deceptive to claim that thermal imaging detects moisture because the best that it can do is detect thermal differences. Using the infrared camera to help discover moisture issues is helpful because once the anomalies are identified then moisture meters and other diagnostic tools can be used to identify the source of the anomaly. Moisture equals mold. Whenever a leak and moist conditions exists longer than 72 hours, then mold can form. This fact is a reality and the infrared camera can quickly, nd in a non-invasive manner, help identify these issues. But remember, the infrared camera identifies the heat signatures and does not measure the moisture content. REAL LIFE EXPERIENCE - Please take a look at the image to the right. This series of photos shows the brickwork above the mantel in a typical Utah 1970’s home. There was no visible evidence of any moisture when looking at the interior brick with the naked eye. As I scanned the interior walls of the home I found a large anomaly just below the ceiling line above the fireplace. This led to further investigation and the discovery of long term ongoing roof leakage at the chimney. The home was vacant and in the process of being flipped by an investor and being sold “As Is”. This also meant that there was no real disclosure by the investor because they reported that they had never lived in the home. The fact that they had repainted after stripping out all of the floor coverings did not seem to mean anything to the investor. The fresh paint and new carpet totally concealed the evidences of any past water entry. The identification of the thermal differences with the infrared camera led to further investigation that confirmed the ongoing water entry leak. In the difficult to access attic there was long term staining and damage resulting from this leak. Our clients were thankful that the non-disclosed ongoing leak was identified before closing on the home. How can this technology be useful?? 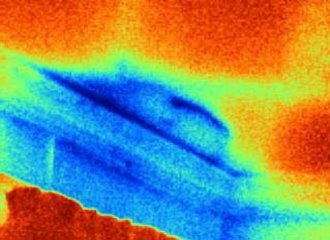 Moisture Detection in Walls and Ceilings - As demonstrated above, thermal imaging is a great tool that helps to identifying water damage in walls, floors, and ceilings. 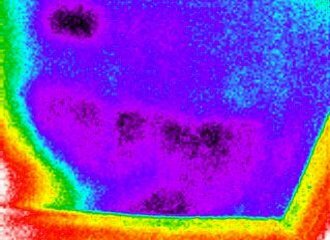 By detecting the difference in temperature between a wet area and the surrounding dry areas thermal imaging can help detect moisture issues that would not be visible during a limited visual home inspection. It is also great at identifying areas where the insulation contractor failed to insulate adequately. Stucco & EIFS Inspections - Thermal image scanning has greatly improved our ability to perform stucco and EIFS moisture intrusion inspections. 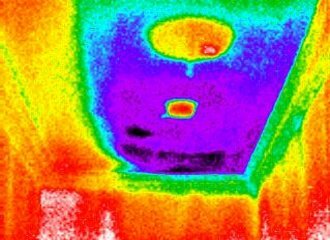 If there is rot behind the stucco it is often visible with thermal imaging in the form of heat anomalies. Thermal image scanning also helps to quantify the affected areas of moisture damage. By adding this tool to our stucco inspections we have been able to better identify where the trouble areas are that need repair. Energy Audits - We do not currently specialize in performing energy audits, but thermal imaging has been a great tool to help homeowners save money, especially now that energy rates are on the rise. Heat loss and/or cold air influx can be detected and corrective actions can be taken to help improve the energy efficiency of residential and commercial structures. Once the energy wasting areas are identified, then changes can be made to make a dramatic difference in energy consumption which means less money out of pocket. Flat Roof Inspections - If you have a leak on a new to mid life flat roof and have been told that a new roof is needed, then call us first. We may be able to save you a substantial amount of money. Thermal imaging can be used to detect the precise location of the leak and mark the affected area so that repairs can be made to the leaking area. Obviously, if the roof is older then you should forego the thermal imaging and invest in the needed new roof. Electrical Inspections - Loose or dirty electrical connections and other electrical anomalies can cause power outages and possible fires. We can inspect the electrical panels and receptacles to detect issues before there is a costly outage. Thermal imaging can detect hot spots in the electrical system not visible to the naked eye which may be a precursor to a larger issue. The resulting report can be a great aid for the repair electrician hired to address the identified issues. Plumbing Inspections - Water leaks from the plumbing system often leak undetected until major damage has occurred. We can scan in, under, and around plumbing fixtures in the home to determine if there is active leaking going on. Since this tool is not a moisture meter we will use it to find heat anomalies and then pursue the issue further to attempt to determine the source and cause of the leak. 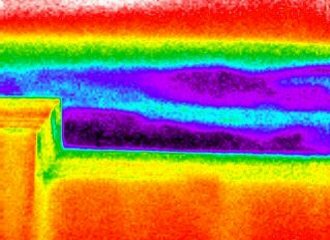 Thermal image scanning can detect temperature anomalies in the plumbing system not visible to the naked eye which may be a precursor to a larger issue. The resulting Thermal Image Scan report can be a great aid for the repair plumber hired to address the identified issues. We are often hired to help our clients with preventive maintenance programs or to pinpoint leaks in homes and businesses. To request a thermal image scan and/or moisture intrusion inspection please fill out our specialty inspection request form. Adding this service during the normal home inspection saves 40-50% off the normal stand alone thermal image scanning fee.